Cargo freight crime prevention in the United Kingdom is a critical issue since the country is a major source of trade and the third largest economy in Europe. Excluding the United States and China, the country primarily conducts trade with neighboring European countries, resulting in a large exchange of goods being imported and exported in the country. The U.K. cargo thefts and trends report created in partnership with BSI and NaVCIS seeks to highlight major areas of concern, targeted modalities and commodities, and theft tactics utilised throughout the United Kingdom. BSI assesses that companies lost at least an estimated £54 million ($76 million) due to cargo theft in 2017, demonstrating the significant amount of commerce lost in the country annually. However, taking into account limitations in cargo crime collection, BSI anticipates that this loss value is likely much higher. BSI’s quarterly report analysing nationwide trends, hot spot locations, and criminal tactics helps shippers and law enforcement agencies to establish and implement strong measures to deter cargo crimes. SI recorded 454 theft incidents from cargo vehicles in the United Kingdom during the first quarter of 2018. BSI assesses that 80 percent of these incidents involved cargo theft crim es, with the remaining 20 percent of incidents involving thefts of fuel, vehicle parts, and driver personal belongings. Although not as valuable as thefts of cargo loads, these peripheral incidents highlight cargo truck vulnerabilities and exhibit the potential for criminals to expand these types of theft operations to target cargo shipments. BSI identified the M1 as the top highway route for cargo theft incidents in 2017. 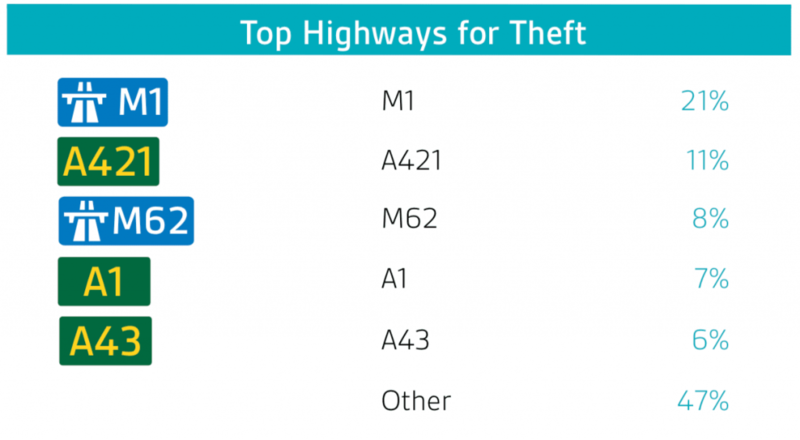 The M1 motorway remains the top highway route in Q1 2018 for cargo theft in the United Kingdom, and drivers tend to favour this motorway due to its convenience for distributing freight north-south through the United Kingdom and the substantial number of rest areas needed to meet legal rest requirements. The large volume of freight transiting this motorway provides thieves with ample opportunity for targeting cargo trucks, and BSI assesses that thieves often repeatedly target the same include the A421 and M62, which saw the second and third highest number of theft incidents during this time. Additionally, BSI approximately 66 thefts occurred along this transportation route. Thefts on the M1 represent 21 percent of all highway freight thefts that occurred in the country during the first quarter. Cargo truck rest areas to steal goods along this route. Other high-risk highways M2 highways. 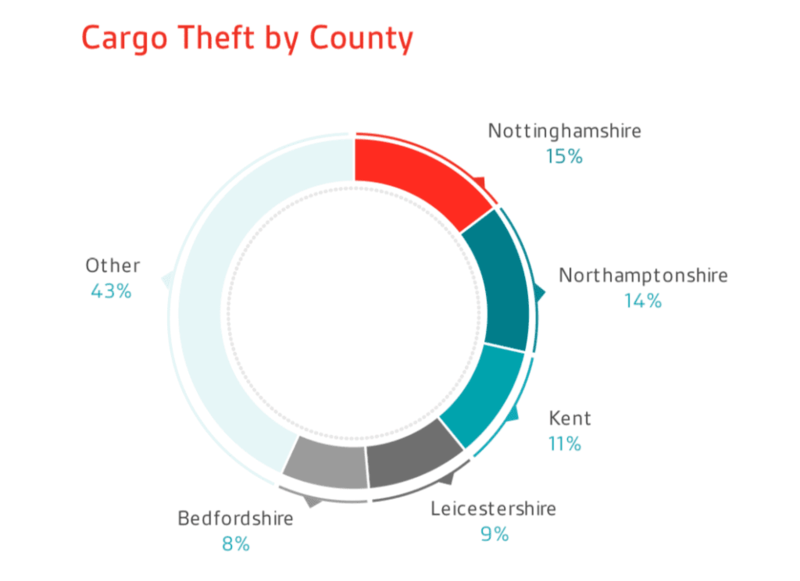 Nottinghamshire is the top county for cargo theft in the United Kingdom during the first quarter of 2018, accounting for 16 percent of all incidents. Companies lost £1.1 ($1.5 million) of freight due to theft in this county, which represents eight percent of the total value of goods stolen in the United Kingdom during the time period. Nottinghamshire experienced the most incidents of cargo theft in January and February of 2018, which exceeded the number of incidents recorded during any single month of 2017. BSI attributes this to a recent rise in general crime throughout the county during the first quarter. Newark on Trent, Trowell, and Worksop are the greatest hot spots for cargo theft in Nottinghamshire during Q1. BSI previously recorded high rates of cargo theft in these cities throughout 2017. Other notable areas of concern include Markham Moor and the city of Nottingham. These cities often generate the highest number of cargo theft incidents in Nottinghamshire County due to their presence along two major roadways, such as the M1 and A1. Overall, cargo thieves primarily targeted trucks travelling along the A1 roadway, and thefts on this route accounted for 41 percent of incidents along highway routes in Nottinghamshire during the first quarter. Cargo thieves in the United Kingdom occasionally implement sophisticated or violent methods to steal goods from cargo facilities or vehicles. However, thieves most frequently use the quarter of the year. 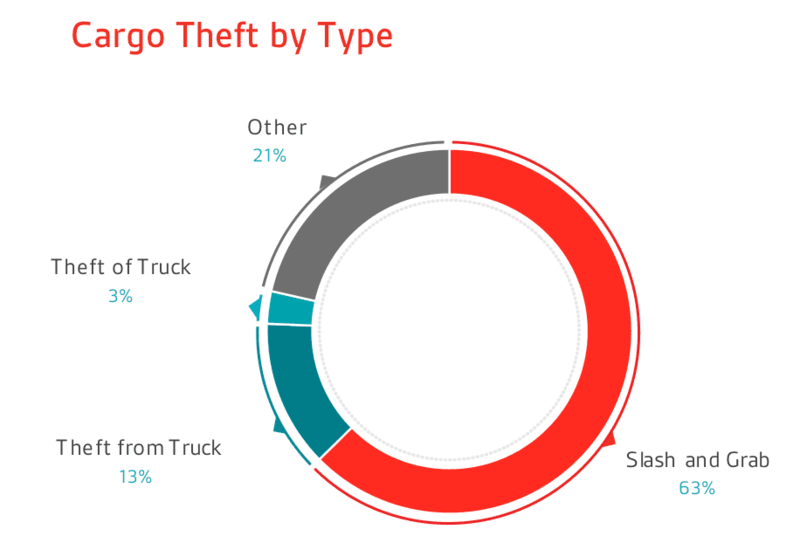 This method accounted for nearly 63 percent 1o4%f all cargo theft incidents during the first quarter. The slash-and-grab tactic involves thieves cutting into the tarpaulins of soft-sided cargo trucks. Cargo trucks transporting freight with soft-sided trailers are most at risk to cargo theft in the United Kingdom. Thieves can easily open soft-sided trailers with a knife, allowing criminals to move swiftly between trucks to choose which loads are most valuable and steal cargo. Shippers relying on this modality should ensure that transporters are utilising additional security measures to mitigate cargo theft risks, such as reinforced tarps. Another major theft tactic involves thieves cutting the back locks of trailers to unload and steal cargo. Other theft incidents that BSI recorded in the first quarter of this year involved fictitious pick-ups, hijackings, in-transit truck thefts, and thefts of whole cargo vehicles. BSI has repeatedly reported on the issues of cargo trucks relying of off-road laybys and industrial estates, for overnight parking. Trucks that rely on these parking locations for overnight rest are extremely vulnerable to criminal activity. Companies should ensure that their transport providers utilize lists of agreed upon secure overnight parking locations to ensure that drivers are not forced to rely on off-road laybys. Transporters should try to avoid a high reliance on U.K. roadways, such as the A1, A43, and A14, since these routes often lack sufficient parking facilities for overnight rest and may force transporters to use laybys to meet rest requirements. Many cargo thefts go unnoticed until a full stock take has been conducted at its final destination. Determining a theft at the earliest point possible is key to be able to report it in sufficient time for a full investigation to be conducted. Security seals allow the driver of the cargo to determine if a security breach has occurred and to report it before the cargo reaches its destination. The benefit of using these security seals is that after an item is sealed, it’s easy to tell if a product, box, or cargo container has been tampered with. This allows for quick identification of a breach and for quick action to be taken to increase the odds of stolen cargo being located and retrieved. Tightening your company supply chain is imperative to ensuring the absolute maximum security to transported cargo. The good news is that there are ways to thwart thieves, whether organized or individuals. Just as the theft of pharmaceutical cargo loads dropped as the supply chain tightened its grip, other companies can avoid theft in the same way. You can read the full BSI report on cargo theft by clicking here.